It's cold, it's green, ...it even has avocado in it, but this not my fourth avocado soup in a month, it is... 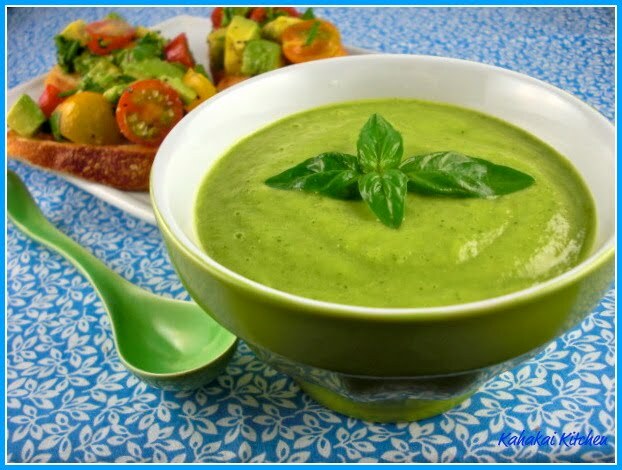 Smooth Zucchini Soup! 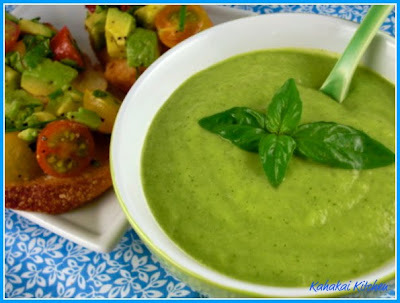 Even though I made a vow of no more cold green avocado soups, I couldn't resist this one even with the avocado in it, liking it's "sister" recipe, the Raw Zucchini Hummus that I made not too long ago. There is a simple beauty in a raw vegetable soup. You just chop up a few things, toss them in the blender or food processor, blitz it, put it in the fridge to chill and it's done. When you are ready to serve, give it a stir and place it in your favorite cups or bowls. 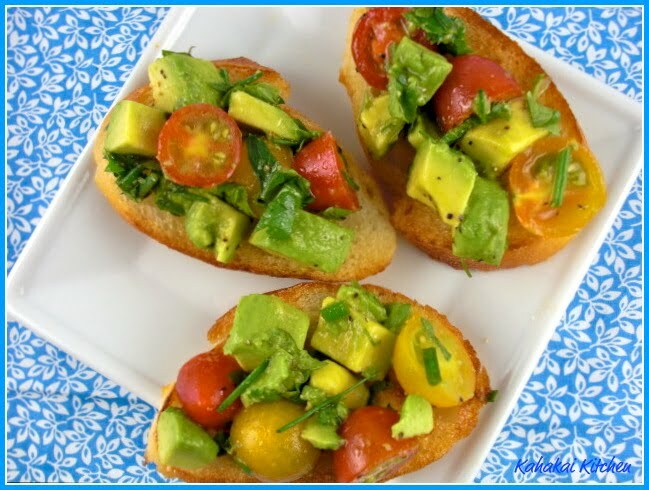 For just a tiny bit more effort you can use the other avocado half and make some easy Tomato-Avocado-Herb Bruschetta to serve with it and you have a simple, flavorful, vegetarian meal, that is healthy to boot. The zucchini, from the farmers market, was lurking around my fridge, the basil is from my herb garden--as are the herbs in the bruschetta. 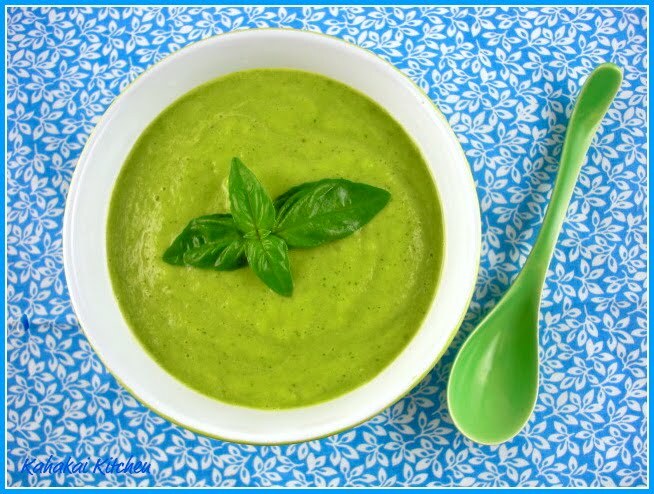 VegNews says, "Fast, fresh, and flavorful, this simple soup takes advantage of summer's abundant zucchini and fresh basil." In a blender, process zucchini, lemon juice, salt, avocado, basil, and water. With the blender going, slowly drizzle in oil, and blend until completely smooth. Serve cool. For the Tomato-Avocado-Herb Bruschetta: I mixed the avocado and tomatoes with an assortment of chopped fresh herbs from my garden; cilantro, oregano, parsley, basil and green onion, and tossed it with a couple of squeezes of fresh lime juice, a drizzle of olive oil and some sea salt and freshly ground pepper. For the base I used a garlic baguette from the market, toasted with a little olive oil. Notes/Results: Smooth, cool and delicious. I used about double the lemon juice and extra basil than the recipe called for so it had a lot of flavor. The texture was not quite as thick as the avocado soups I have been making, but it is still very satisfying which I like. The recipe says it serves one, but the soup is rich enough to serve as too small bowls with the bruschetta (delicious and perfect with the soup) or a sandwich. A very tasty, no-effort soup that I will make again. Tigerfish from Tezcape--An Escape to Food has a sunny Clam and Corn Soup from her published cookbook, "The Everything Rice Cooker Cookbook." She says, "This word: seafoodiness. 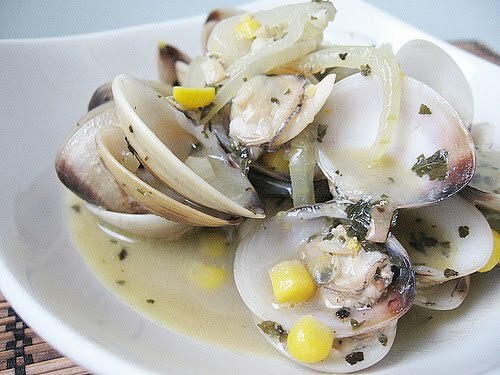 Weird word but best describes clams - taste of the sea. Salty. Clams typically turn out savory in a dish so by adding sweet corn kernels, the balance of flavors leveled up." It is nice to have Chaya from Chaya's Comfy Cook Blog back with us this week and with a creamy Smoked Salmon and Baked Potato Soup. 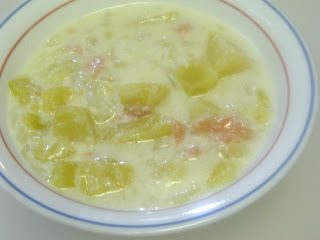 Chaya says, "Today, for lunch, suddenly, I had an urge for potato soup and for smoked salmon, not necessarily together. 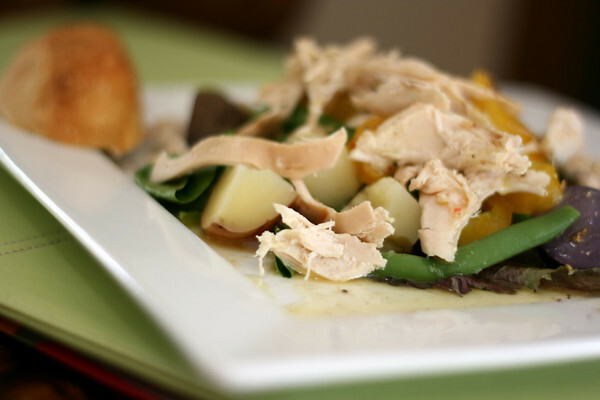 It is easy enough to throw a a quick and easy potato soup together, by pure instinct. Then, pure instinct spoke again and I ended up putting the salmon, in the soup. A great combination." 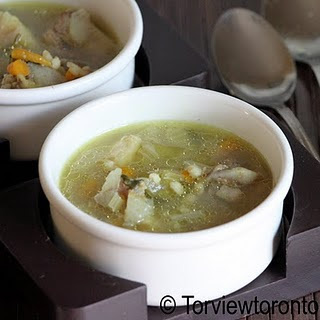 We are lucky to have Ahkeela from Torviewtoronto back with us this week and with a pressure cooker Beef Barley Soup that she says is "quick, delicious, healthy and filling." You can't ask for more than that! This soup is full of good for you ingredients and fast to make in the pressure cooker. 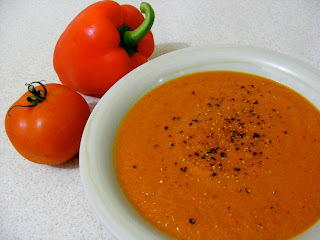 A new face to welcome is Bhagyashri from Taste Buds, blogging from London and making her first appearance at Souper Sundays with a Roasted Red Pepper & Tomato Soup. She says, "Red peppers have a special place in my fridge, the rule is there should always be at least one red pepper in the fridge to be used whenever the need arrives. And it is needed every 2 days usually. The best use is of course in this soup which is so simple to make that it leaves you doubtful about the way it will turn out. But it is super delicious and a great change from the regular Tomato Soup while giving you the same satisfaction." Welcome Bhagyashri! I am happy that Anca from Bistro Gerard is here again this week with a hearty Seafood and Corn Chowder. She says, "As with so many other wonderful dishes, chowder is open to a lot of interpretation and experimenting in many kitchens, with versions ranging from those relying on just a few ingredients, to those that are quite complex. Ours is a very rustic version, with a lovely chunky texture from the mixed vegetables and seafood, whose delicate flavour is accentuated by a dash of cream, while a generous sprinkling of fresh herbs adds a wonderfully vibrant and uplifting final note." My lovely friend Pam from Sidewalk Shoes makes the most of her weekly rotisserie chicken with a Chicken Salad with Green Beans, Potatoes and Peppers and says, "I just now realized that this is my third Real Simple recipe this week. I can’t help it, when I find something that works for me, I say with it; I’m boring that way! I don’t know how I found this, either searching for green beans or shredded, cooked chicken, both of which I needed to use up. 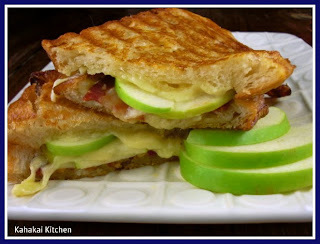 Again, I feel like a broken record, but this was wonderful, quick, flavorful and easy." Kim from Liv Life has a colorful White Bean Salad with Lemon Vinaigrette to share this week and says, "Finding a recipe that is tasty, quick and healthy is always a treasure, something to be held on to and shared. 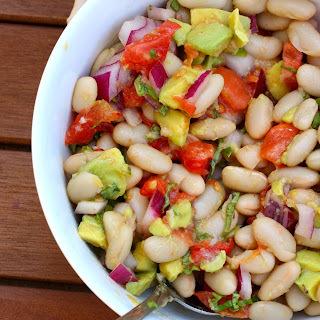 White Bean Salad fits that bill. Garden fresh ingredients tossed with a can of Cannellini Beans and a lemony vinaigrette give you a side salad in a matter of minutes, perfect for that night when time is running short. The ingredients are easily interchanged based on what you have on hand making preparation a piece of cake." Another newbie this week is Lana from Bibberche, joining us from Southern California and with her Extra Snazzy BLT Sandwich. Lana says, "We bought the onion rolls at Albertson’s. I whipped up a cup of mayonnaise in no time while the bacon sizzled in the pan. We crisped up the rolls in the oven for five minutes and presented the casual dinner on the “lazy susan” in the middle of the table. The AC was humming quietly in the background and nobody complained of being too hot or too cold. We love living in California and this dinner was a casual celebration of the state and the bounty it provides. Fresh tomatoes and avocados don’t need a lot of frills to satisfy." Welcome Lana! Another round of delicious dishes this week--thanks to all who joined in and welcome to our new faces. If you have a soup, salad or sandwich that you would like to share, just click on the Souper Sundays logo on the side bar for all of the details on how to participate. I love the vibrant green colors in your soup, bruschetta, and apple-y sandwich, too. Making me HUNGRY! Great roundup, but I have to say, Max is the cutest thing ever! Max rocks...they are so cool and collected, aren't they!? ;) I really love the sound of the soup...but it's the bruschetta that has me drooling this week! Tasty roundup, too. hope you're having a great weekend, that soup looks great! Thanks, Deb, for hosting this event. Growing up we ate soup almost every day. I continue the tradition and a day without soup is very rare. 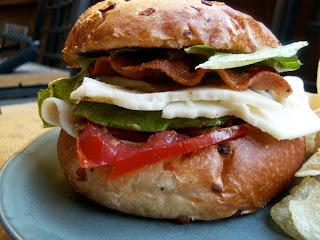 Once a while the heat would determine the menu, and I'd go with a sandwich. I have never tried making soup from raw ingredients, not even gazpacho, but now I am intrigued. It looks very refreshing, clean-tasting and easy to make. I always enjoy seeing your raw recipes. It's something that I haven't dappled with yet, but would like to. If it's the "sister" to the raw zucchini hummus then I'm definitely ready to dive in! It's okay deb. You have an addiction. We understand. It's best not to kick addictions cold turkey anyway. Good idea to wean yourself off with this lovely soup! Great use of zucchini, I wish I knew about this recipe a couple of weeks ago when we had a fridge full of them! 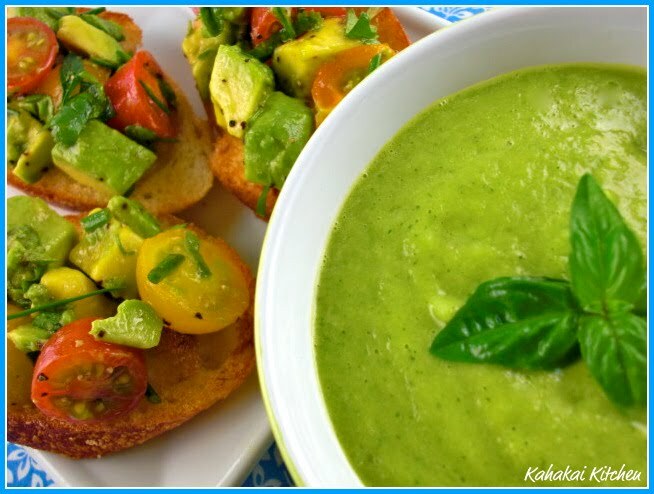 I love the pairing with avocado, this sounds like the perfect summer soup. Deb, I have been so overwhelmingly busy I've sure missed out on contributing lately. Things are calming down and can't wait to be a part of Souper Sunday again. 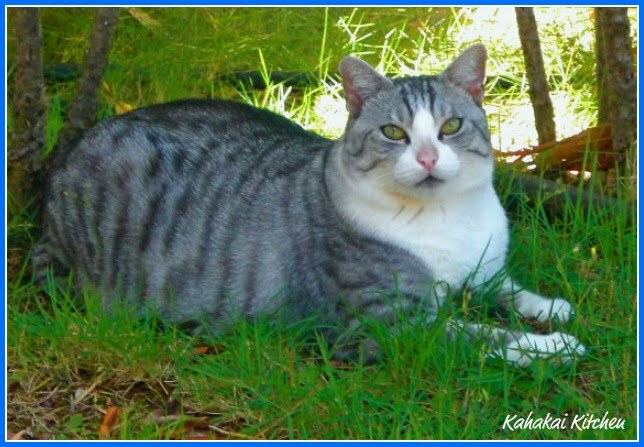 Max is quite a handsome kitty! So pretty! And you have won my heart with that bruschetta. Hugs to Max - proving that big guys can be regal! Great round-up, and Max looks really regal! Can You Guess the Herb?